Karma Organic nail care products – nail polish remover and nail polish – can you make your nails beautiful in this life while they repair past neglect and prepare your nails for a healthy future. The polish remover is so outstanding it won Allure Magazine’s Editors’ Choice Award in 2009. Karma Organic products are environmentally friendly and crafted from U.S. non-GMO organic soybean oil. 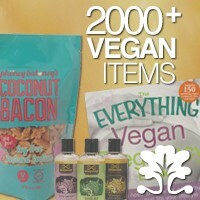 Each purchase supports organic farmers. They also make an environmentally friendly base coat and offer chic gift sets. It felt soft and moisturizing. It didn’t strip the oil from our fingers. It worked very well, even removing tough glitter polishes (although we had to soak a bit for this). There was no scent – no chemical smell at all! Then, of course, we tried the nail polish. It is fabulous. Chip-resistant, it withstands wear and tear. It comes in an amazing range of colors: literally all the colors of the rainbow, including bright, shimmery coppers and golds. The shine is exceptional! Notice the dazzle of the “Christmas Morning” shade, shown in the photo above. There are no chemical hazards in Karma Organic products: no formaldehyde, toluene, or DBP. FYI: It is important to avoid the Big 3 chemicals — formaldehyde, toluene, and DBP – which are commonly used in commercial beauty products. These chemicals can cause cancer, allergies, and developmental and reproductive disorders. Skin Deep, a service of the Campaign for Safe Cosmetics which identifies toxins and hazards in beauty products, rates each of the Big 3 as a 10 on the hazard scale of 0-10. Learn more about the Big 3 and how to avoid them. 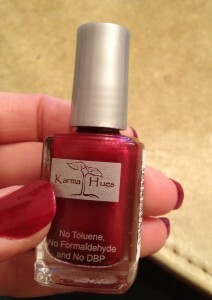 For more information on the terrific and SAFE nail products by Karma Organic, go to the Karma Organic website. Where do you buy this, and is it wheat/gluten free?